In 2018, the Journal of Character Education, Volume 14(1), published an extensive 15-year study. This study documents the development of the Character Development & Leadership Program and the supporting research studies since 2003. It also highlights how the CD&L Program is aligned with the ELA common core standards and how the 10 lesson plans per trait address the individual learning styles of students. This is a summary report that identifies the findings and trends from the individual yearly reports that can be accessed further down this page. We feel that this report in addition to the annual reports listed below will suffice when someone asks if this is “evidence-based,” or if districts want to use categorical funds to purchase the CD&L Program. This published study (Journal of Character Education, Volume 12(1), 2016) identifies the effectiveness of the CD&L program used as an English Curriculum. 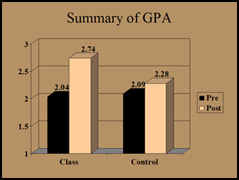 A triangulated case study used student records, field notes, and interviews of stakeholders to compare the academic year prior to this substitution and the two academic years following it. All three sources of data agreed that using the character education curriculum to meet ELA and ELD standards was associated with increased attendance, percentage of passed coursework each semester, and higher grade point averages. There also may have been greater student body cohesion, a more positive group process, and heightened employability values, habits, and skills. With over 2,500 schools participating from all 50 states and 8 countries, this has become one of the largest research studies at the secondary level on character education in America. Each school that uses this curriculum has the option of participating in the research package for a nominal fee. This includes students taking online pre-surveys at the beginning of the semester and post-surveys at the end of the semester. We analyze 84 different variables and break these variables into 3 Desirable Attribute Scales and 6 Undesirable Attribute Scales. In addition, we ask students to evaluate the program and the level to which it improved their lives. CD&L provides each participating school with an “all-schools” report and an “individual school report, allowing principals and teachers to understand how well this curriculum is working at their respective school. The following is a summary of the research package and what the reports entail. The mission of the CD&L Program is to foster perceptions, attitudes, and actions necessary to the development of healthy character and leadership in emerging citizens. Feedback from 1,348 male and female socioculturally- and subculturally diverse high school students demonstrates three vital things: 1. As group the students valued this program. 2. 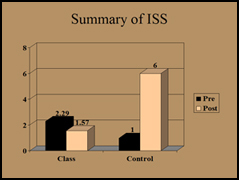 As a group they demonstrated a decrease in school-disruptive behaviors. 3. Students who had social acumen entering the program didn’t change much. However, students who entered the program with problematic character traits and behaviors improved so much that, at the end of their CD&L program, they were very similar to the more socially mature students. Twenty-seven high schools and five intermediate schools participated in the 2014-2015 empirical outcomes assessment. Self-reports by 330 socio-culturally and socio-economically diverse students before and after their participation in the CD&L Program were compared to assess changes in attitudes and behavior. Despite the leveling effect of this diversity on the data, all of the students as a group valued the CD&L Program, demonstrated a decrease in school disruptive behaviors and other antisocial actions, and demonstrated an increase in prosocial expectations and behaviors. The mission of the CD&L Program is to foster perceptions, attitudes, and actions necessary to the development of healthy character and leadership in emerging citizens. This program is taught by classroom teachers to secondary students. Feedback from 4331 male and female socioculturally- and subculturally-diverse students indicates that they are on their way. As a group they valued this program and they demonstrated an increase in prosocial expectations and behaviors and a decrease in negative ones, including school disruptive behaviors and other antisocial actions. In the 2004-2005 school year 74 high schools used a curriculum called Character Development & Leadership (CD&L). Of those schools, 28 schools participated in the research study. 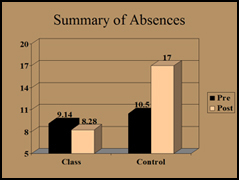 Of those schools, 11 met the criteria to be included in the study: (1) students in the course completed the on-line pre-test, (2) students in the course completed the on-line post-test and (3) schools collected official office data on attendance, suspensions, grade point averages and End of Course (EOC) tests. Additionally, four schools provided control groups. Finally, it should be noted that of the 11 schools included in this report, all of the students were freshmen. We hypothesized that strengthening a child’s character would improve other important aspects of a student’s life – now we are proving it! Based on these findings we marketed this class to high school teachers and administrators. As a result, this curriculum is being used by over 1800 high schools, middle schools, and alternative schools in the United States.